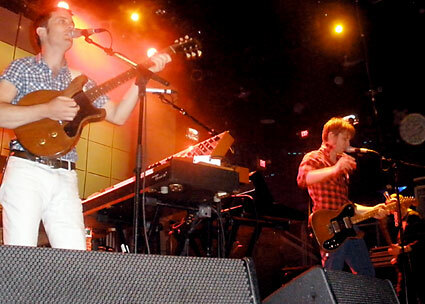 Franz Ferdinand lead crooner and guitarist Alex Kapranos told Rolling Stone last year he wanted to capture “that naive energy you have as a kid when you hear music and you can’t control your body’s reaction to it, you can’t help flinging yourself around the room and bouncing up and down.” The youthful throng that gathered at the Electric Factory in Philadelphia, powered by Red Bull and Franz, certainly exhibited that hormonal, jumping-on-the-furniture behavior. Prior to the show, I contemplated hitting up a Starbucks, but the Scottish art-rock quartet’s performance was way better than downing a quad espresso. Armed with my photo pass, I slipped into the lane that divided the armpit-to-ear crowd and the stage. The only other photographer in the alley was wielding two professional cameras the size of AK-47s. When my screen blinked “Memory Full” after 25 shots, I turned around and saw the dude behind me staring at my handheld $49 Olympus. I shrugged. Hot Topic drones with braces and Amy Winehouse eyeliner leaned over the barrier, probably inflicting some kidney damage as they tried to get as close as possible to the stage. Yes, I am a yard away from Alex Kapranos and his skinny jeans and you are not. The band’s set was comprehensive and dance-provoking, comprising “Take Me Out” as well as tunes off the more recent Tonight: Franz Ferdinand. Kapranos’ cascading, theatrical vocals punctuated vigorous synthesizers and drum machines as the group shimmied around onstage, at one point causing sensory overload when all four members started wailing on Paul Thomson’s drum set and the strobe lights went berserk. Franz Ferdinand was really big on audience participation. Kapranos directed his microphone to the crowd after just about every “La la la la” and “Ohhhh.” I kind of felt like I’d flown my ’88 DeLorean back in time to a Naughty By Nature concert. At the end of the night, I definitely took away some of that crazy naive energy Kapranos described, and I’m pretty sure that doesn’t come in a Venti.